Tech Manual for U.S. Robotics Sportster 28.8 Modem direct from USR BBS. SYMBOL 227 \f "Symbol" 1995 by U.S. Robotics Access Corp. NOTE: Unless otherwise indicated, settings listed as default are based on the hardware flow control template stored in NVRAM when the modem is shipped. References to DIP switches only apply to modems with DIP switches. To send commands directly to your modem, first put your computer in Terminal mode. Some communications programs do this automatically upon loading. Others require you to display a communications terminal screen, press a Function key, or perform some other operation. Refer to your communications software documentation for instructions. 1.Type all commands in either upper case (AT) or lower case (at), but not a combination (At). 2.All commands except A/ (re-execute last command) and +++ (escape code) must be preceded by the AT prefix and are executed with the Enter/Carriage Return key (). 3.The command string can be a maximum of 60 characters. The modem doesnt count the Carriage Return character or spaces. In a dial string, it counts, but doesnt act on, punctuation, such as hyphens and parentheses. 4.A missing numeric parameter is assumed to be zero, as in the command to hang up; ATH is the same as ATH0 . To dial a phone number and place a call without using your softwares dialing directory, first put the computer in Terminal mode. Then type the AT and D commands, the number you wish to connect with, and press Enter. Spaces in our command examples are ignored by the modem and are only included for readability. After you have entered the command (unless you lowered your modems speaker volume), you will hear the modem go off hook and dial the telephone number, followed by a series of handshaking signals. The Dial command string may include up to 60 characters. The modem counts but ignores punctuation characters such as parentheses and hyphens. It does not count the Carriage Return key () required to execute the command. The modem also executes any other commands or options included in the command line. The following example instructs the modem to turn off the speaker (M0) and dial (D) the phone number (1234567) using tone dialing (T). You may want to review the many options on the next several pages that are available for tailoring Dial strings. To cancel Dial command execution, press any key. If you inadvertently hit a key on the keyboard while the modem is dialing, the call is canceled. If this occurs, type the A/ command, which re-executes the last command you entered. You can modify the dial string according to the needs of the connection. Listed below are options available to you when entering the Dial string. The modem defaults to pulse (rotary) dialing. To have the modem use tone dialing, which includes the asterisk (*) and pound sign (#), use the T option. Dial type commands may be included in the Dial string (ATDT number) or issued separately (ATT or ATP). However, if youll always use tone dialing, write tone dialing to NVRAM as the modems default and/or use adaptive dialing, described in the next section, Adaptive Dialing. NOTE: You can switch from one dial type to another within a dialing sequence. The modem remains set to the last dialing type instruction until it is reset by using the ATZ command or it receives a different dial-type command. When any of the X2 through X4 (default) result code options is in effect and you do not issue a dial type in the Dial string, the modem defaults to pulse dialing. If you issue a tone dial command, the modem will default to Hunt dialing, beginning with tone and adapting to pulse when necessary. For instance, if the phone companys central office does not have tone-detection equipment, the modem automatically reverts to pulse dialing. This command is useful in situations where you must wait for a second dial tone before continuing to dial. For example, if you need to dial for an outside line, as in the following example, the modem resumes dialing as soon as it detects the next dial tone. NOTE: This command executes only if result code option X2 or X4 (default) has been issued. If the modem is set to X0, X1, or X3, the modem interprets the W as a comma (two-second pause). A comma causes a two-second delay in the dial sequence. The following example contains four-second delays at several points. The first four-second pause is to access an outside line after dialing 9, but you may wish to use the W option, described above. The second pause is to make sure the remote system is ready for the users account number, and the third, to delay before dialing the long-distance number. Such pauses, however, may not be necessary. Experiment and use delays only as required. The duration of the delay can be changed by using the S8 register. The default duration of the delay is 2 seconds. A slash (/) can be used in any command string to make the modem pause for only 125 milliseconds. Some users find it helpful to have the shorter delay resulting from a series of slashes, rather than the two-second comma pause. If your phone is plugged into the modem, you can use this option to have the modem Auto Dial a telephone rather than a modem. The modem dials, remains off hook, and returns the OK message, indicating it is in Command mode. For example, to have the modem place a voice call, enter the Dial command with a semicolon. When the modem returns the OK result, pick up your phone receiver so you can talk to the other party and send the command that hangs up the modem. Similarly, to call a recorded weather or other service, have the modem dial, listen to the recording over the modems speaker, and when you are finished, instruct the modem to hang up. This command is used for modems installed where other modems share the phone line. The modem flashes the switch-hook. That is, it goes off hook 0.5 seconds, on hook for 0.5 seconds, and off hook again to dial the specified extension. The following example includes instructions to transfer the call to extension 1234, return to Command mode (;) and to hang up (H). Some online services answer the phone and return a tape-recorded request for information before processing transactions. In such instances, the @ command can be used in the Dial string to tell the modem to detect at least one ring, wait for five seconds of silence at the other end of the call, and then continue to execute the Dial string. To use the @ command, set the modem result code option to X3 or X4 (default). If the modem is set to X2 or lower, the modem returns an ERROR message when it encounters the @ character in a command string. In the next example, the modem is set to the X3 result code option and dials a banking service. Each occurrence of @ in the example indicates a five-second wait for silence. The pauses here are for taped requests from the bank for a password (12345), an account number (6789), and a transaction code (2). The transaction code might indicate, for example, a request for an account balance. If the necessary conditions do not occurno rings or no following five seconds of silencethe modem times out as it normally would (after 60 seconds). It then sends the message NO ANSWER to the screen and aborts the call. This command allows calls to an originate-only modem (a modem set up to send only). It reverses the modems originate/answer frequencies, forcing the modem to dial out at the answer frequency. The command follows the Dial command, before or after the phone number. You can store up to four frequently used telephone numbers in nonvolatile random-access memory (NVRAM). Use the &Zn=s command to store telephone numbers, where n is the position of the number in NVRAM (0symbol 45 \f "Symbol"3) and s is the stored number. The following command string stores the telephone number (4441212) at position 1 in NVRAM. To dial a stored number, use the DSn command, where n is the position of the number in NVRAM (0symbol 45 \f "Symbol"3). In the first example, the modem dials the phone number stored at position 0. In the second, the modem dials the phone number stored at position 3. NOTE: Do not include modem settings in the &Zn=s string. If the call requires special settings, insert them in the command string before the DSn command. For example, &K3 (selective data compression) is inserted before the Dial command to call the number stored at position 0. This establishes &K3 as the current setting. To return to default data compression mode after the call, issue the following command. The most frequent reason for redialing is receipt of a busy signal. Your modem provides two redialing options, as follows. When you want to redial a number, enter the DL command. The modem dials the last-dialed number, which it has stored in a special buffer. To display the number stored in the last-dialed buffer, use the following query. To write the last number dialed to NVRAM, use &Zn=L where n is the position in NVRAM. The following example stores the last-dialed number at position 3. If a number is already stored at position 3, that number is overwritten with the last-dialed number. Another option for redialing is to enter the A/ command. This command does not require the AT prefix or a Carriage Return. When the modem receives a command, it stores it in its command buffer until it receives the next AT command. The A/ command re-executes whatever AT command is currently stored in the buffer. NOTE: If youve sent the modem an additional command since the Dial command, A/ repeats that command instead of redialing. Your modem is shipped with Auto Answer suppressed (DIP switch 5 on). To set the modem to automatically answer incoming calls, do one of the following. Set DIP switch 5 off (up). When you power on, the modem answers incoming calls on the first ring. If you want the modem to answer after several rings, set DIP switch 7 off (up). Specify the rings you want the modem to answer on in NVRAM (default is 1 ring). The valid range is 1 to 255 rings. Power off the modem and power it on again with its new DIP switch and NVRAM settings. NOTE: You can select how many rings must occur before the modem answers by setting n in ATS0=n to the number of rings you want. If you use your phone line for both voice and modem calls, you may not want the modem to answer immediately (so that you can answer voice calls). When the modem senses a call, it sends the RING result code to your screen, goes off hook, and sends the remote modem a high-pitched answer tone. If the sending modem does not receive back a Carrier Detect signal within 60 seconds, the sending modem hangs up. If the connection is made, the modem returns a CONNECT result code. When a call is disconnected by you or the remote user, the modem hangs up and returns the NO CARRIER code to the computer screen. You can set the modem to receive calls when youre not at your computer. Load your communications software, and set the modem to Auto Answer. Also set your softwares file-save function to save incoming messages and/or files. If youve attached your phone so it can be used for conventional calls, disable Auto Answer when you are not expecting incoming data calls or set S0 to a high number. Otherwise, your modem may answer the phone before you do, greeting a voice caller with a high-pitched answer tone. To disable Auto Answer, set DIP switch 5 on (up) before powering on the modem, or set the modem to answer on zero (or no) rings during the current session. NOTE: The S-register setting S0=0 cannot be saved to NVRAM. If youve disabled Auto Answer but are expecting an incoming data call, use the Manual Answer (A) command. Send the modem the following command after the RING result code appears on your screen. When the call is disconnected, the modem returns to its original state, Auto Answer disabled. Use the commands described below to instruct the modem to disconnect the call and hang up the line. Once the modem is online to another system, the only command it recognizes is an escape code of three plus symbols that forces the modem into Online-Command mode. Issue the escape command in the following sequence. Wait one second after sending the last item of data. Type three plus symbols (+++). Wait one second before typing any data. Do not type the AT prefix or a Carriage Return. The guard time of one second before and after prevents the modem from misinterpreting the presence of the +++ symbols in the transmitted data stream. If necessary, the character used in the escape code or the duration of the guard time can be changed by resetting register S2 or S12. The default for register S2 is 43, and the function of this register is to store the ASCII decimal code for the escape code character (+). The default for register S12 is 50, and the function of this register is to set the duration, in fiftieths of a second, of the guard time for the escape code sequence (+++). When the modem receives +++, by default it enters Online-Command mode and returns the OK result code. It maintains the connection and is ready to act on commands. You may then choose one of the following options. Issue commands to the modem and then return it online. Alternatively, if you want the modem automatically to hang up on receiving the +++ escape code, set Register S13 to 128 and write the command to your NVRAM templates. See the following. The modem disconnects and sends the NO CARRIER result code to the screen. After forcing the modem into Online-Command mode with the escape code sequence, you can issue commands and then switch (toggle) the modem back online with the O command, as in the following example. O1Returns online and retrains. If errors occur during a non-ARQ (error control) connection, try this option. The modem returns online and requests that both modems resynchronize. At its default setting, the escape code forces the modem into Online-Command mode but leaves the line open. To hang up the modem, issue the following command once the modem sends the OK result code. H0Hangs up (goes on hook). This command lets you send a Break signal to abort data transfer without disconnecting from the phone line interface. &Y0Destructive, no Break signal transmitted: the modem clears the data from its transmit buffer (all data is lost) but does not transmit the Break signal to the remote modem. &Y1Destructive, expedited: the modem clears the buffer and immediately sends a Break signal to the remote modem. Default. &Y2Nondestructive, expedited: the modem retains data in the transmit buffer, but immediately sends a Break signal to the remote modem. &Y328.8 only. Nondestructive, unexpedited (send Break in sequence): the modem transmits any buffer data received before the Break, sends the Break, and then sends any subsequent input from the computer. If the call is under MNP5 data compression, destructive Breaks cause both modems to reset their data compression tables. When transmission resumes, the modems build new tables, and the result is lower than normal throughput. The following commands apply to international calls. To answer international calls, use the default B0 setting. B0Default. This setting is required for V.32 or higher modems to answer V.32 or higher calls. It also selects the ITU-T V.25 answer sequence, used outside of North America. B1This setting selects the Bell 2225 Hz answer tone used in the U.S. and Canada and may be used when the remote modem operates at only 2400 bps or lower. However, if the modem is set to B1, it wont be recognized by V.32 bis modems and cant answer calls at 9600 bps and above. The United Kingdom and some Commonwealth countries use phone switching systems that require answering modems to send an 1800 Hz guard tone after they send an answer tone. Some other European phone networks require a 550 Hz guard tone. Guard tones are not used in the United States or Canada. &G0No guard tone, U.S./Canada. Default. &G1550 Hz guard tone follows answer tone. Requires B0 setting. &G21800 Hz guard tone follows answer tone, United Kingdom and some Commonwealth countries. Requires B0 setting. This command sets the ratio of the off-hook/on-hook (make/break) interval for pulse dialing. The default sets the modem for use in North America. The ratio must be changed if the modem is used to dial out in the United Kingdom and some Commonwealth countries. &P0Make/break ratio, U.S./Canada: 39%/61%. Default. &P1Make/break ratio, United Kingdom, some Commonwealth countries: 33%/67%. Select this option to call or answer overseas modems at 300 bps. In V.21 mode, the modem answers Bell 103/V.21 calls, but only originates V.21 calls. This option is enabled in Register S27 with the following command. Some United Kingdom and European systems require a V.23 connection (that is, 1200-bps speed with a 75-bps back channel). Enable the V.23 option with Register S27=16. In addition, force a 1200 connection with &N2 and disable error correction with &M0. You can establish a V.23 connection with the following command. Your modem is preconfigured at the factory so you should be able to connect the modem, set up your communications software, and be ready to send and receive data. Many users wont need to change the default configurations, but if you want to, this section will tell you how. Many of the functions described below can be handled by your communications software, but you also have the power to place your computer in Terminal mode (via your communications software) and control the modem directly. The modem is preconfigured at the factory with three permanent and two programmable templates. The following permanent templates come with your modem. The default template consists of the most reliable settings, but these settings may not work for all users. &F0Low performance template. This template does not include performance features, such as a fixed serial port rate or hardware flow control. What it does offer is compatibility with atypical computers or software that cannot handle flow control and other features. If you need a low performance template because of data-transfer difficulties, load this template by entering the following command. This template allows you to communicate with atypical systems that cannot handle flow control and other features. &F1Hardware flow control template. Default. This template sets the modem to hardware flow control, a fixed serial port rate, the highest level result codes, and the most complete result-code set. This template is recommended for all IBM-compatible computers, as long as your communications software supports hardware flow control, a fixed serial port rate, and the advanced result-code subset. &F2Software flow control template. We recommend you do not use this template unless your communications software ONLY supports software flow control. To load this template and save it as your power-on/reset default, enter the following command. NOTE: Refer to the next section in this chapter, Programmable Templates, for more information on selecting and modifying templates to save as your start-up configuration. In addition to the &Fn permanent configuration templates, you can use two programmable templates. Your programmable templates are located in nonvolatile random access memory (NVRAM), which will retain values when the modem is powered off. By default, the modem loads NVRAM template 0 (or Y0) for its power-on/reset default settings. Y0Loads NVRAM template 0 used with the hardware flow control template (&F1). Default. Y1Loads NVRAM template 1 used with the software flow control template (&F2). For example, if you want to switch the power-on/reset default NVRAM template from Y0 to Y1, enter the Y command, then reset the modem with the Z command. To customize other defaults you want to store in NVRAM as part of your customized power-on/reset template, use the &Wn command (see the next section, Customizing Your Defaults, in this chapter). When your modem is shipped, it uses template 0 in NVRAM as the power-on/reset default. Template 0 (Y0) is initially loaded with the &F1 permanent configuration settings. Although you cannot alter the &F1 template, you can add, delete, or modify the settings stored in your NVRAM templates. It is more likely, however, that you will want to keep your power-on/reset default settings and simply change a setting for a current session. Refer to the next chapter, Temporarily Changing a Setting, for more information. &W0Modifies the NVRAM 0 template (Y0). &W1Modifies the NVRAM 1 template (Y1). Typically, users prefer the default settings stored in NVRAM when the modem is shipped, but you may set up different power-on/reset defaults. For instance, if your system supports hardware flow control, you can set your Y1 template to the settings for hardware flow control so both templates set the modem for hardware flow control. The Y0 template is shipped with hardware flow control settings. NOTE: Yn is unique because it writes itself to NVRAM; you do not need to use the &Wn command to load a programmable template. Similarly, if your system only supports software flow control, you can set your Y0 template to the settings for software flow control so both templates set the modem for software flow control. The Y1 template is shipped with software flow control settings. You may also specify the entire configuration in a single command string that ends with the &Wn command. The following example sets the modem for the current session and stores the configuration in NVRAM 1 (or Y1). After sending a configuration to NVRAM, you can change any setting just for the current session, as in the following example. The NVRAM configuration remains intact. But if you want the new setting to be a default, write it to NVRAM at the same time, as in the following example, which saves the setting to NVRAM template 0. If youve sent the modem commands to change settings throughout your session and want to save your current configuration, send just the &Wn command. The current settings are then written to NVRAM 0 (or Y0) as in the example below. If you cannot use hardware flow control and need to use Xmodem-type file transfer protocols, use either Y0 or Y1 for a no flow control configuration with no error control. If youve changed several current settings and want to reset to your modem, use the following command. The modem reads its DIP switch settings and resets to its NVRAM defaults (DIP switch 7 off) or the &F0 Low Performance template (DIP switch 7 on) settings. Use the ATZ command if you've changed the position of DIP switches 1-7 while the modem is on, so that the modem can read the new settings. The only other way to initiate a new setting for switches 1-7 is to turn the modem off and on again. NOTE: You cannot issue additional commands on the same line with the Z command, because the modem will ignore everything following the Z command. For example, if you enter ATZE1Q0 the modem ignores the E1Q0 portion of the command string. When you change a setting, the modem retains it until you do one of the following. Issue the ATZ command to reset the modem to the profile by the Y command. Turn the system off and power it on again. The modem defaults to pulse (rotary) dialing. To have the modem use tone dialing, which lets you use the asterisk (*) and pound sign (#) in the dialing string, use the T command. The modems speaker enables you to monitor the dial-connect process. There are several ways to make use of this feature. 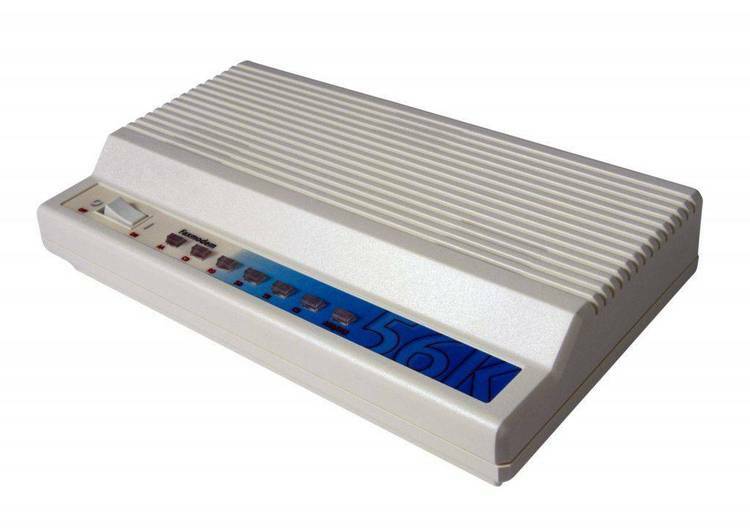 After the modem dials a number, it waits up to 60 seconds for a high-pitched answer tone from the other modem, immediately followed by data signals, called a carrier. These signals must occur before a data link is established. At the default X4 setting, the modem sends your screen the NO CARRIER message after 60 seconds. If you listen to the speaker and realize you have received a voice answer, you can respond immediately, instead of waiting for the modem to time out and send the NO CARRIER message, by pressing any key on the keyboard. This cancels the call. You can also hear if dialing is proceeding too quickly for the system. If so, terminate the call by pressing any key and retype the Dial command, but insert a comma (,) or a couple of slashes (/) to have the modem pause during the dialing process. The following options allow you to adjust the speaker of an internal modem. NOTE: For an external modem, the volume control knob is on the left side panel of the modem. This command disables the speaker entirely or sets the speaker to monitor different segments of the dial-connect sequence. M0Disables the speaker entirely so that you dont hear the modem go off hook, dial, etc. M1The speaker is on until your modem detects the remote modems carrier signal. Default. You can monitor call progress until your modem detects the remote modems carrier signals, or until the 60-second timeout and NO CARRIER result code display. When your modem detects a carrier signal, the modem disconnects the speaker and data-transmission sounds are suppressed. M2The speaker is on continuously, including during data transmission. M3The speaker doesnt turn on until after the last digit is dialed, then goes off when your modem detects the remote modems carrier signal. Local echo is the display of what you type at the keyboard, and online echo is the display of data the modem transmits to another modem. The En command controls the display of your typed commands when the modem is in Command mode. The Fn command controls the display of data when your modem is online to another system. The power-on/reset default for command mode local echo is set with DIP switch 4. The modem is shipped with DIP switch 4 off, enabling local echo of your typed commands. Use the En command to control the local echo for a current session, independent of the switch setting. This command cannot be stored in NVRAM. E0Command mode echo OFF. The modem does not display keyboard commands. NOTE: If double characters appear on the screen when you type, you have activated both the modems and softwares local echo commands and one of them should be deactivated. This command causes the modem to display a copy of the data it is transmitting to another system. Many receiving modems, however, also return a copy of received data, which is called a remote echo. If the modems online echo is ON and there is also remote echoing, double characters appear on the screen. In some microcomputer documentation, the term duplex is applied to online local echoing, although the term is not technically accurate. F0Online echo ON. Sometimes called half duplex. As the modem transmits data to a remote system, it also sends a copy of the data to the local screen. F1Online echo OFF. Sometimes called full duplex. Default. The S-registers are used to set various timing parameters and to redefine selected ASCII characters and other configuration options. Refer to the S-Register Options list under Template Settings in the Technical Specifications chapter for a summary of S-register functions and setting options. Users typically require the default values. To change a setting, use the ATSr=n command, where r is the register and n is a decimal value from 0-255 (unless otherwise indicated). The example below sets the modems test timer (S-register 18) to 10 seconds. The modem does not perform a value-range check. Thus, some values you select may not work with some equipment, and youll have to readjust the settings. Use ATSr? to display the contents of a register. Four commands control the result codes that the modem returns to the screen. These commands are explained in the following sections. You can select whether result codes are sent to the screen in words (verbal mode) or numbers (numeric mode). The power-on/reset default for response modes is set with DIP switch 2. The modem is shipped with DIP switch 2 off, enabling verbal mode. Use the Vn command to select verbal or numeric result codes for a current session, independent of the DIP switch setting. This command cannot be stored in NVRAM. V0Numeric mode. Numeric result codes are displayed on the same line as your AT command, as in the following example, where a 3 is returned for NO CARRIER. V1Verbal mode. Default. Verbal responses are displayed on the next line after your command, as shown below. Enables/suppresses the display of result codes. The power-on/reset default for response modes is set with DIP switch 3. The modem is shipped with DIP switch 3 on (up) to display result codes. Use the Qn command to control the display for your current session. This command cannot be stored in NVRAM if you have DIP switches on your modem. However, it can be stored on modems without DIP switches. Q0Result codes are displayed. Default. Q2Result codes are suppressed only in Answer mode. You have five options, X0 through X4, for selecting the result-code set best suited to your applications, as shown in the following tables. X0Basic set. Returns the first five codes (0-4) in the following table. X1Extended set (codes 0-5, 10, 13 and 18). Adds rate-specific CONNECT messages to the Basic set. This set also includes all &An result codes. X2-4The default is X4. These options include the X1 set, call-progress codes 6 or 7, and 8, and the functions listed in the following table. NOTE: By default, the modem is also set to &A3, which selects additional results that report the protocols used in the connection. More CONNECT messages indicate an error control connection, the call modulation, or the error control and data compression used. See the next section, Additional Result Code Options (&An), in this chapter. 1/CONNECTConnection established with another modem; if set to X0, connection may be 300symbol 45 \f "Symbol" \s 1028,800 bps; if X1 or higher, connection is at 300 bps. 3/NO CARRIER Carrier may not be detected or carrier has been dropped due to disconnect. 5/CONNECT 1200Connection established with another modem at 1200 bps. 6/NO DIAL TONEDial tone not detected during the normal 2 seconds, set in Register S6. 7/BUSYBusy signal detected; modem hangs up. 8/NO ANSWERAfter waiting 5 seconds for an answer, modem hangs up; returned instead of NO CARRIER when the @ dialing option is used. 10/CONNECT 2400Connection at reported rate. Same for results of 4800 (18), 9600 (13), 7200 (20), 12K (21), 14.4K (25), 16.8K (43), 19.2K (85), 21.6K (91), 24K (99), 26.4K (103), 28.8K (107). Adaptive Dialing (HUNT)The modem attempts to use tone dialing, and if that doesnt work, it reverts to rotary (pulse) dialing. Wait for AnotherThe modem halts dialing until it detects another dial tone. Fast DialThe modem dials immediately after detecting a dial-tone, instead of waiting the normal 2 seconds set in register S6. Use this command to enable/disable one of the following sets of error control, modulation, or protocol result codes. If you encounter software problems, it may be because your software expects to find different result codes from those the modem is sending. (The modem defaults to &A3.) Review your software documentation or try &A2, &A1, or &A0. You may need to call your softwares technical support to find out which &An setting they support. &A0ARQ (error control) codes are disabled. This setting does not affect an error control connection; the modem returns standard CONNECT messages if result codes are enabled. &A1ARQ codes are enabled. CONNECT/ARQ is displayed if the modem is set to X0 and the connection is 1200 bps and above. If the modem is set to X1 or above, the results indicate the connection rate. If your software cannot handle the ARQ codes, select &A0. &A2V.32 modulation codes are enabled. These results require a setting of X1 or higher. If your software cannot handle the added modulation information, select &A1 or &A0. &A3Protocol codes are enabled. Default. Error control protocols reported are LAPM or MNP. When the call is not under one of those protocols (and ARQ is not included in the result code), the modem reports NONE, for no protocol. If the modems are using data compression, the type of compression, V42BIS or MNP5, is added to the result code. If your software cannot handle the added protocol information, select &A2, &A1, or &A0. Although these codes will return numeric identifiers if youve set the modem to V0, they are the same numeric identifiers used for &A2 result codes. If you want &A3 protocol indicators, use verbal mode (V1), and not numeric mode (V0). By default, the modem first attempts a connection using V.42 (LAPM) error control and, if that doesnt succeed, it attempts an MNP connection. If that doesnt succeed, the modem tries to connect without error control. Error control is possible at rates of 1200 bps and above. The following options are available. NOTE: ARQ is a term for error control protocols that include error detection and automatic retransmission of corrupted blocks of data. &M0Normal mode, no error control. Because of the nature of phone-line channels, this is never recommended for calls above 2400 bps unless youre using an error-correcting file-transfer protocol. &M4Normal/ARQ mode. Default. If the remote modem doesnt recognize the modems error control signals (V.42 or MNP) your modem will operate in normal mode, as though it were set to &M0. &M5ARQ mode. If the remote modem doesnt recognize the error control request, V.42 or MNP, the modem hangs up. Always set the modem for error control, &M4 (default) or &M5, for calls at speeds over 2400 bps. Most users communicating with V.42- or MNP-compatible modems will want error control at 2400 and 1200 bps, as well. If youre dialing and have trouble connecting, it may be because the remote modem doesnt have MNP capability, and it misinterprets your modems MNP error control request. If you know the remote modem doesnt support MNP, disable MNP handshaking on a 28.8 modem by setting register S27 to 16 (ATS27=16) and on a 14.4 modem by setting register S15 to 4 (ATS15=4). The modem still connects, but without MNP error control. To reset the modem for normal operations after the call, issue the ATZ (reset) command or set register S27 to zero. When set to &M4 or &M5 and a call comes in, the modem goes off hook and responds to received error control signals. If the modem doesnt receive those signals and is set to Normal/ARQ mode (&M4), it answers the call in Normal mode (&M0). If it doesnt receive the signals and is set to ARQ mode (&M5), it hangs up. When data compression is enabled, the transmitting modem detects redundant units of data and recodes them into shorter units of fewer bits. The receiving modem decompresses the redundant data units before passing them to the receiving computer. Compression does not occur unless the modems can establish an error control connection. If the modem makes a V.42 connection, it negotiates V.42 bis compression. If V.42 bis is not feasible, the connection remains under error control, but without data compression. If the modem makes an MNP connection, it negotiates for MNP level 5 (MNP5) data compression. If the remote modem does not have MNP5 capability, the connection remains under MNP error control, but without compression. &K2Data compression enabled. Use this setting to keep the modem from disabling compression. &K3Selective data compression. The modem negotiates only for V.42 bis compression, and disables MNP level 5 (MNP5) compression. See the following note. NOTE: MNP5 compression is not useful when transferring already compressed files, such as the .ZIP files downloaded from computer bulletin boards (BBS) and 8-bit binary files that appear already compressed to the modem. MNP5 tends to add data to these files, and as a result, throughput over the phone link degrades. V.42bis compression detects when data is already compressed and turns off until it detects that compression will be advantageous. The special &K3 setting allows the best throughput for already compressed and 8-bit binary files. The &Bn and &Nn commands control data rates at the serial port and phone line interfaces. Your modem defaults to a fixed rate at the serial port interface (&B1) to keep the serial port rate higher than the connection rate. Youll get greater throughput regardless of the connection rate. Your software, however, must support this feature, and you must set your software to use a fixed rate. For the phone line, however, we recommend variable connection rates (&N0). This lets the modem switch its connection rate to match the rate of a remote modem, no matter what that rate is. If the connection rate is fixed, for example, at 9600 bps (&N6), the modem only connects with modems operating at that rate. Of course, if your application requires connections with modems at only one rate, you may wish to set the modem to a fixed connection rate. Both variable and fixed serial port rates require communications software support. Most communications programs support variable or fixed rates. Check your software manual. Set your software before making calls. Initially, the modems serial port rate is dependent on your software setting. The modem detects the rate at which it receives the AT command to determine the serial port rate. After that, the modem depends on its &B setting. &B0Variable serial port rates. The modem switches its serial port rate to follow the connection rate your local modem established with a remote modem. If your software has Auto Baud Detect, turn it on. The software will switch its serial port rate to match the connection rate. &B1Fixed serial port rate. Default. The modem detects its serial port rate from your last AT command and maintains it, whatever the connection rate. Set your software to 115.2K, 57.6K, 38.4K, or 19.2K bps, then set the modem to &B1 for the best throughput. Some programs require that you turn off Auto Baud Detect to fix the serial port rate. Others use the term Serial Port Lock (yes or no). The serial port rate must equal or exceed the connection rate. Also, this setting requires flow control, preferably hardware flow control (&H1), to avoid buffer overflow. &B2Fixed for ARQ calls/Variable for non-ARQ calls, Answer mode only. When the modem goes off hook and answers in ARQ mode, it shifts its serial port rate to the one written to NVRAM, for example, 38.4K bps. In non-ARQ mode, it acts as if set to &B0 when answering, and switches its serial port rate to match the calls connection rate. This option is designed for installations such as bulletin boards that receive calls from a wide variety of modems. Use the &Nn command to select variable or fixed rates at the phone-line interface. Variable rates let the modem connect with a variety of remote modems, while fixed rates limit calls to one connection rate. &N0Variable rates. Default. Your modem negotiates with the remote modem for the highest possible connection rate, depending on the capabilities of the remote modem. This is the recommended setting. rate. If not, the modem hangs up. Also, it sets the ceiling rate if &Un is greater than 0 (for 28.8 only). The fixed rate options are as follows. By fixing the connection rate, you can filter out calls at other than a specific rate, such as for security reasons. Use the &Un command (28.8 modems only) to set the floor connect rate when &Un is set greater than 0. &Nn is the ceiling connect rate. &U1-14Fixed rate options as follows. The modem uses either hardware or software flow control to manage the amount of data stored in the buffers, thus preventing buffer overflow. Your modem defaults to hardware flow control. This type of flow control is performed between the modem and computer via discreet signals sent through the serial port. Software flow control uses the standard ASCII Transmit OFF (XOFF) character, Ctrl-S, and the Transmit ON (XON) character, Ctrl-Q. ASCII definitions are as follows. NOTE: Both your software and computer must support the flow control you select. All 100% IBM PC-compatible computers support hardware flow control. However, hardware flow control requires software support. Refer to your software documentation to see what flow control your software supports. Be sure to set your software appropriately before transferring files. If possible, use hardware flow control. See the next section, Software Flow Control Warning, in this chapter. If you cant use hardware flow control and are doing Xmodem-type protocol or binary file transfers, select a protocol that performs error correction, and turn off the modems error control (AT&M0). In ordinary operations, the only characters the modem recognizes during a call are the three plus symbols (+++) of the escape code that return it to Command mode. But when software flow control is enabled, the modem or computer also recognizes Ctrl-S or Ctrl-Q characters. If these characters occur in a file or as part of a protocol, the modem interprets them as XON/XOFF characters and acts on them. For example, XON/XOFF characters occur in binary files and are used by Xmodem-type protocols. They may also come from the remote system. An XON from the remote system, after your modem has sent an XOFF, can result in buffer overflow. Software flow control may prove satisfactory if youre only transferring text files; however, you may lose data if XON/XOFF characters occur in the data stream from other sources. To select software flow control, write the &F2 configuration template to Y1. This type of flow control regulates data your computer transmits to your modem for transmission over the phone link. The modem monitors its Transmit Data buffer as data comes in from the computer. If the buffer nears 90% capacity, the modem signals the computer to stop transmitting. When the modem has sent enough data over the phone link to empty half the buffer, the modem signals the computer to resume transmitting. Transmit Data flow control should be enabled in the following situations. Youre using error control (any allowable rate above 300 bps) with or without data compression. If data is resent due to errors, a continuous stream of data from the computer could overflow the modems buffer. The serial port rate is higher than the connection rate. For example, the serial port rate is 38.4K bps and the connection rate is 14.4K bps. NOTE: Set your software to either hardware or software flow control. Some programs also require that you turn off the type you are not using. &H0Transmit Data flow control disabled. &H1Hardware flow control. Default. Your computer and software must support the Clear to Send (CTS) signal. The modem drops the Clear to Send (CTS) signal to the computer when its buffer nears 90% capacity and starts sending CTS again when the buffer is about half full. &H2Software flow control. Your software must support XON/XOFF signaling. The modem sends an XOFF to the terminal when its buffer nears 90% capacity and sends an XON when the buffer is about half full. Default in the &F2 Software Flow Control template. &H3Use both hardware and software flow control. Select this option if youre not sure what your computer supports. Two commands, &Rn (hardware) and &In (software), control the flow of received data passed by the modem to your computer. Because computers handle incoming data more quickly than the modem receives it over the phone line, most applications wont need this. When your computer drops its Request to Send (RTS) signal, the modem stops passing along received data to the computer. The computer sends RTS again when it is ready to receive more data. Your computer and software must support RTS. However, you cannot use this type of flow control if your software requires a constant RTS signal. NOTE: Use hardware flow control only for ARQ (error control) calls, because the V.42 and MNP protocols control the data flow across the phone link. During non-ARQ calls, however, there is no way to signal the remote modem to stop sending data. If your modem stops passing data to your computer and the remote modem keeps sending, your modems Received Data buffer will overflow. &R1The modem ignores Request to Send (RTS). This setting is required if your software does not support RTS. &R2Hardware flow control of received data enabled. Default. The modem passes received data to your computer only on receipt of the RTS signal. When you send your modem a Ctrl-S (XOFF) command from the keyboard, the modem stops passing received data to your computer. When you send a Ctrl-Q (XON) command, your modem resumes. NOTE: Because of the risk of data loss, &I1symbol 45 \f "Symbol"5 are recommended only if your data does not have XON/XOFF control characters. See the section Software Flow Control Warning earlier in this chapter. &I0Disables XON/XOFF flow control of received data. Default. Recommended for non-ARQ calls. &I1The modem acts on your typed Ctrl-S/Ctrl-Q commands and passes them to the remote computer. Not recommended for non-ARQ calls. Use in ARQ mode only, but keep in mind that XON/XOFF characters sent to the remote computer may interfere with XON/XOFF signaling between it and the remote modem. &I2 is preferred for ARQ calls. &I2Your modem reacts to your XON/XOFF commands but removes them before sending data to the remote computer. This is the default in the &F2 (Software Flow Control) template. Recommended setting for ARQ mode only. It ensures that the remote computer does not confuse its modems XON/XOFF characters with yours. If the call is not in ARQ mode, there is no flow control on the phone link. If you send an XOFF to your modem and it stops passing data, it has no way to tell the remote computer and modem to stop sending for a while, and your modems buffer may overflow. See &I5 for another alternative. &I5Enables phone link flow control when the connection is not under error control. Both modems must use &I5. In ARQ mode, the modem operates as if set to &I2. It acts on XON/XOFF commands but does not pass them on to the remote system. In non-ARQ mode, the modem acts as if set to &I0. It does not look for local XON/OFF commands but does look for any XON/XOFF characters coming in over the phone link from the remote computer. The modem acts upon them and drops them from the data stream. Operators can signal the other modem to stop sending and control phone link data flow to keep their modems buffer from overflowing, if both are set to &I5. The parameters described below are directly affected by the serial connection and DIP switch settings. The power-on/reset default for Carrier Detect is set with DIP switch 6. The modem is shipped with DIP switch 6 off (down), disabling override for normal operations. Use the &Cn command to control Carrier Detect for a current session, independent of the switch setting. Check your communications software manual to find the required setting. This command cannot be stored in NVRAM. &C0CD override, CD always on. &C1Normal CD operations. The modem sends a CD signal when connecting with another modem and drops CD upon disconnecting. Most communications software programs require this setting. The power-on/reset default for Data Terminal Ready is set with DIP switch 1. The modem is shipped with DIP switch 1 off (down), disabling override for normal operations. Use the &Dn command to control DTR for a current session, independent of the switch setting. Check your communications software manual to find the required setting. This command cannot be stored in NVRAM. &D0DTR override, modem ignores DTR. &D2Normal DTR operations. The computer or terminal must send a DTR signal or the modem wont accept commands. Dropping DTR terminates a call. Most communications software programs require this setting. The modem sends your computer a Data Set Ready (DSR) signal. (Data Set is industry jargon for modem.) Few, if any, commercial communications programs require the modem to control DSR (&S1). Leave the modem set for DSR override (&S0), unless you know that your installation requires a different setting. &S0DSR is always on (override). Default. &S1In Originate mode, the modem sends DSR after dialing, when it detects the remote modems answer tone. In Answer mode, it sends DSR after sending an answer tone. Checking the Help screens is the first step in troubleshooting. These screens give you the information youll need to identify a problem. Once a problem is identified, it can be solved easily. The Inquiry command has eight options. The most commonly used options display the following information. I0The modem returns a product code. If you have a problem and call Technical Support, you will be asked for this product code. I1The modem performs a checksum of its read-only memory (ROM) and returns the result to the screen. This function is used only in factory testing. The modem should always read the same number. I2The modem performs a test of its random-access memory (RAM) and returns either the OK (0) or ERROR (4) result code, followed by OK when the test is completed. Use this command as a checkpoint if the modem appears to be malfunctioning. I3The modem returns a product identification string. I4The modem displays its current configuration. I5The modem displays the stored phone numbers and two templates (Y0 and Y1) stored in nonvolatile random access memory (NVRAM). Activate the second screen by pressing any key. I6During a connection, the modem monitors and stores information about link operations. Use this command to request a diagnostic summary. For calls under data compression, the number of characters sent may be less than the number of octets sent due to buffering operations. Octets: Compressed data units. If the number of octets is greater than the number of characters sent, the modems probably used MNP5 compression on an already compressed file, and the result was expanded data. Blers: Errors in data and protocol blocks. If there were many block errors, your modem may have experienced problems receiving data from the line. Blocks Resent: These represent blocks the remote modem resent due to the previous category, Blers. Link Timeouts: Protocol detection problems; communications were severed momentarily and the modems probably recovered. This does not indicate the retry timeout. Link Naks: Negative acknowledgments (one or more blocks). Data Compression: Indicates the type of data compression negotiated for the call (V42BIS or MNP5) or NONE. A V42BIS response includes the size of the dictionary and the maximum string length used, for example, 2048/32. Fallback: Enabled/Disabled: indicates whether the modems negotiated online fallback during the connection sequence. Protocol: Indicates the error control protocol negotiated (LAPM, MNP, NONE). Speed: The last rates at which the receiver/transmitter were operating before disconnecting. symbol 183 \f "Symbol" \s 10 \hDTR dropped: The DTE dropped the Data Terminal Ready signal, terminating the call. symbol 183 \f "Symbol" \s 10 \hEscape code: You sent the modem the +++ escape code. symbol 183 \f "Symbol" \s 10 \hLoss of carrier: The modem detected loss of the remote modems carrier and waited the duration specified in Register S10 (default is 0.7 seconds). symbol 183 \f "Symbol" \s 10 \hInactivity timeout: The modem detected no activity on the line for the duration specified in Register S19 (default is 0, timer disabled). symbol 183 \f "Symbol" \s 10 \hMNP incompatibility: The modem is set to &M5 and the remote modem does not have MNP compatibility, or there was an MNP negotiation procedure error. symbol 183 \f "Symbol" \s 10 \hRetransmit limit: The modems reached the maximum of 12 attempts to transfer a data frame without error. symbol 183 \f "Symbol" \s 10 \hLD received: The remote modem sent an MNP error control link disconnect request. symbol 183 \f "Symbol" \s 10 \hDISC: The remote modem sent a V.42 disconnect frame. symbol 183 \f "Symbol" \s 10 \hLoop loss disconnect: The modem detected a loss of current on the loop connecting it with the telephone company central office. This usually occurs because the remote modem has hung up. The central office drops current momentarily when there is a disconnect at the other end of a call. Unless Register S38 is set higher than 0, the modem immediately hangs up at loop loss. symbol 183 \f "Symbol" \s 10 \hUnable to retrain: After several attempts, disturbances on the phone line prevented the modems from retraining (resynchronizing), and they could no longer transmit or receive data. symbol 183 \f "Symbol" \s 10 \hInvalid speed: The modem is set to &N1 or higher for a fixed link rate, and the remote modem is not operating at the same rate. symbol 183 \f "Symbol" \s 10 \hXID timeout: The modems failed to negotiate the V.42 detection (XID exchange) phase. symbol 183 \f "Symbol" \s 10 \hSABME (Set asynchronous balance mode extended) timeout: The modems failed this part of V.42 link negotiation. symbol 183 \f "Symbol" \s 10 \hBreak timeout: Incompatible processing of a Break signal occurred. symbol 183 \f "Symbol" \s 10 \hInvalid codeword: The modem received an invalid V.42 bis (compression) frame. symbol 183 \f "Symbol" \s 10 \hA rootless tree: The modem received an invalid V.42 bis (compression) frame. symbol 183 \f "Symbol" \s 10 \hIllegal command code: The modem received an invalid V.42 bis (compression) frame. symbol 183 \f "Symbol" \s 10 \hExtra stepup: The modem received an invalid V.42 bis (compression) frame. I7The modem returns a product configuration. If you have a problem and call Technical Support, you may be asked to read this screen. This command allows you to view the contents of a particular S-register, as in the following example that requests the contents of Register S0 ("On what ring will the modem answer?"). Use this command to display the phone number stored in NVRAM at position n, as in the following example that includes a sample modem response. Use this command to display the number stored in the last-dialed number buffer. Your modem provides four Help screens: summaries of the basic AT command set, extended ampersand (&) AT command set, Dial command options, and S-register functions. The following command stops the display. Hold down the Control key and type S.
To restart the display, use the same command or press . Either of the following commands cancels the display. Use AT$, to display a partial summary of the command set. A second screen, activated by pressing any key, shows the remaining commands. Use AT&$ to display a partial summary of the extended ampersand command set. A second screen, activated by pressing any key, shows the remaining command set. Use ATD$, to display the Dial command summary. Use ATS$, to display a partial summary of the S-register functions. A second screen, activated by pressing any key, shows the remaining registers. Modem testing is available with the &Tn command and Register S16 (Dial test). All loopback testing conforms to ITU-T Recommendation V.54. NOTE: Only one test can be performed at a given time. If you send a test command while the modem is already in Test mode, youll receive an ERROR message. The tests supported through the &Tn command include analog loopback, digital loopback, and remote digital loopback. You can key in your own data during testing or use the modems internal test pattern and error detector. Always disable error control before testing. If the modem is detecting errors and, as a result, retransmitting the affected data, your test results will be invalid. Issue the &T0 command to terminate a test. Alternatively, set Register S18 to a specified number of seconds, for example, S18=10. When the 10 seconds are up, the modem automatically ends the test and returns to Command mode. If the test was Analog Loopback, the &T0 command hangs the modem up. If the test was Digital or Remote Digital Loopback, issue an ATH command to hang up the modem or an ATZ command to hang up the modem and reset it to its defaults. NOTE: If you use the S18 test timer, but in the process of testing you issue an ATZ command, S18 resets to zero and the timer is disabled. Also, you cannot store a value for S18 in nonvolatile memory; its power-on and reset default is always zero. This test checks the operation of the modems transmitter and receiver. This analog loopback option requires that you type data you can later verify at your screen. 1.The modem should be on hook in Command mode. If you wish, set Register S18 as a test timer. For example, insert S18=10 in the following command string before &T1. This command instructs the modem to disable error control, set the timer, enter analog loopback (AL) mode, and send a CONNECT message. 2.Type recognizable data so that you can verify it when it is looped back to the screen. 3.End the test. If you set S18, the modem automatically stops the test at the timeout, exits AL mode, and responds OK. The modem responds OK. If the modem sends an ERROR message, you have issued an invalid command. 4.If there were no errors, reset the modem to &M4 (enables error control) unless youve issued the ATZ reset command. NOTE: If the modem is in Online-Command modesymbol 190 \f "Symbol"that is, still connected to a remote modemsymbol 190 \f "Symbol"and you send it an &T1 or &T8 command, it drops the call, enters AL mode, sends a CONNECT result, and waits for loopback characters. This analog loopback (AL) option causes the modem to send an internal test pattern to its transmitter and loop it back to the receiver. An internal error detector counts any errors, and when the test is ended, sends the number of errors or 000 (no errors) to the screen. Since you dont type anything during this test, and the modem does not send anything to the screen, this option verifies only the modem. If there are no errors but your problem continues, it may be at the computer interface. 1.The modem should be on hook in Command mode. If you wish, set Register S18 as a test timer. For example, insert S18=10 in the following command string before &T8. This command instructs the modem to disable error control, set the timer, and enter AL mode. The modem sends its internal test pattern to the transmitter, and loops the pattern back to the receiver. You will not see any data on your screen. 2.End the test. If you set S18, the modem automatically stops the test at the timeout. If you didnt set Register S18, type AT&T0 to end the test. Or use ATH or ATZ to end the test and hang up the modem. When the modem hangs up, it returns a three-digit code, followed by OK. A code of 000 indicates no errors were found. A code of 255 indicates 255 or more errors. An ERROR message indicates that you issued an invalid command. 3.If there were no errors, reset the modem to &M4 (enables error control) unless you issued the ATZ reset command. If your modem has passed the analog loopback (AL) test, the digital loopback test can help you locate a problem with a remote modem or the telephone channel. 1.Set the modem to &M0 to disable error control. Establish a connection with the remote modem. 2.Bring the modem back to Online-Command mode with the +++ escape code. Then send it the AT&T3 command. The modem enters digital loopback (DL) mode. 3.The remote user should type a short message. It will be looped back by your modem for verification on the remote screen. You will not see the message or any other data. 4.When the remote user has completed the test, issue the AT&T0 command to end the test. If you wish, return the modem online (ATO) to resume Data mode. Or use ATH or ATZ to end the test and hang up the modem. The modem responds OK. If the modem sends an ERROR message, you have issued an invalid command. The &T4 option grants a remote modems request for a Remote Digital Loopback test. The &T5 option cancels &T4 and your modem will not recognize a request for a Remote Digital Loopback test from a remote modem. This is the default so that your modem isnt subject to another user calling and tying up your modem without your permission. This test, like the Local Digital Loopback test, verifies the condition of both modems and the phone link. The request for and granting of Remote Digital Loopback testing requires that both modems use ITU-T V.54 standard signaling. The test must be performed at 2400 or 1200 bps. If the remote modem does not have the capability or is not set to respond, you will get an ERROR result code. This remote digital loopback (RDL) option requires that you send keyboard data to the modem and verify it when it is returned over the phone lines and to your screen. 1.Set your software to 2400 or 1200 bps. Set the modem to &M0 (disables error control). If you wish, set the S18 timer. Establish a connection with the remote modem. If you havent already done so, arrange with the remote user to cooperate with your testing. The remote user should set his or her modem to acknowledge the RDL request, for example, AT&T4. 2.Bring the modem back to Online-Command mode with the +++ escape code. Send the modem the AT&T6 command. The modem enters RDL mode. 3.Type a short message. It will be looped back to your modem by the remote modem and to your screen for verification. The remote user will not see your data. 4.End the test. If you set Register S18, the modem automatically ends the test when the test timeout is reached. If you didnt set S18, type AT&T0 to end the test. If you wish, return the modem online (ATO) to resume Data mode. Or use ATH or ATZ to end the test and hang up the modem. The modem responds OK. If you issue an invalid command, the modem sends an ERROR message. Data errors indicate a problem with the remote modem or the phone link. If you have not performed analog loopback testing with your modem, there may also be a problem with your modem. 5.Reset the modem to &M4 (enables error control) unless you used the reset command ATZ. This test option causes the modem to send an internal test pattern through the remote digital loopback. An internal error detector counts any errors, and when the test is ended, sends the number of errors or 000 (no errors) to the screen. You dont need to type anything during this test. The modem sends only its final error count to your screen. 2.Bring the modem back to Online-Command mode with the +++ escape code. Then send it the AT&T7 command. The modem enters RDL mode. The modem sends its internal test pattern to the remote modem, which loops it back to your modem. You will not see the data on your screen. 3.End the test. If you set S18, the modem automatically stops the test when the timer times out. If you didnt set Register S18, type AT&T0 to end the test. After you view the test results (next paragraph), return the modem online if you wish (ATO) and resume Data mode. Or use ATH or ATZ to end the test and hang up the modem. When you terminate the test, the modem returns a three-digit code, followed by OK. A code of 000 indicates no errors were found. A code of 255 indicates 255 or more errors. If you issue an invalid command, the modem sends an ERROR message. If youve performed an analog loopback and know your modem is working properly, errors indicate a problem with either the phone connection or the remote modem. 4.Reset the modem to &M4 (enables error control) unless youve sent it the ATZ reset command. The dial test is used for factory-testing the frequencies of tone dialing values. When S-register 16 is set to 2 and a single tone is dialed (for example, ATD7 ), the modem continues to transmit that tone until you press again. Fax operations require facsimile-compatible software that can send or receive Group III faxes. To send or receive faxes follow the instructions in your fax software manual. The modems normal operating mode is Data mode. If your fax software is typical, it automatically switches the modem to Fax mode when you run the program, and resets the modem to Data mode when you exit the program. If you are not sure whether the modem is in Data or Fax mode, type the following command. The modem returns a 0 to indicate Data mode, a 1 to indicate Class 1 Fax mode or a 2.0 to indicate Class 2.0 Fax Class mode (28.8 modems only). Modems are not compliant with TR-29 (SSP-2388-A) Class 2 facsimile control. NOTE: Whenever you reset the faxmodem by using the ATZ command, toggling the DTR signal, or turning the power off and on, the modem will be set to data mode. 1 Group 3 Facsimile Service Class 1 mode. +FCLASS?Returns to the current FCLASS. +FCLASS=?Returns the possible values of FCLASS. Many fax software products use software flow control when the modem is in Fax mode. To be compatible with software products that use software flow control by default, your modem automatically switches to software flow control when entering Fax mode. For the best information on modem settings, see your fax software manual. Telephone facsimile machinesidentification of the sender of the message: It shall be unlawful for any person within the United States to use a computer or other electronic device to send any message via a telephone facsimile machine unless such a message clearly contains, in a margin at the top or bottom of each transmitted page or on the first page of the transmission, the date and time it is sent and an identification of the business, other entity, or individual sending the message and the telephone number of the sending machine or of such business, other entity, or individual. Telephone facsimile machines manufactured on and after December 20, 1992 must clearly mark such identifying information on each transmitted page. If you want to know more about the supported fax commands, refer to the standard for the Service Class 1 fax protocol. You can obtain a copy of this standard by contacting Global Engineering Documents at 1-800-854-7179. For more information on supported Class 2.0 fax commands, refer to the standard for the Service Class 2.0 fax protocol (28.8 modems only). When you install your modem, it is recommended to plug your phone into the second modular jack of the modem so its available for voice calls. You can also use the phone to set up communications with another user whose modem uses the AT command set, such as another modem. NOTE: If the modem is off hook, the handset will appear to be dead. No sound will be heard through the handset. 1.First call the other user to establish the parity, word length, and number of Stop bits the other persons modem accepts. Then turn the call over to your modems, as follows. 2.Without hanging up the phone, have your modem go off hook in Originate mode. Type the following command. NOTE: Be sure the modem is not set to X2 or X4, or it will return the NO DIAL TONE result code and hang up. 3.The other party should have the remote modem go off hook in Answer mode. The following command is used to do this. 4.Now both of you can hang up your respective phones while the two modems establish the data link. They will maintain the link until one of you gives your modem a command to disconnect. Either partys device can be the originate or answer modem; it doesnt matter who made the phone call. But one modem must enter Originate mode and the other Answer mode. You and the other party, therefore, must agree on which command, ATD or ATA, you will each use. Your modem conforms to the following standards, ensuring compatibility with a wide base of installed modems. ITU-T is the new signifier of what was formerly the CCITT international standards body. The serial interface information below applies only to external modems. It is a standard developed by the Electronic Industries Association (EIA) that defines the signals and voltages used when data is exchanged between a computer and a modem or serial printer. The entire standard covers many more functions than are used in most data communications applications. Data is transmitted between the devices over a shielded serial cable with a 25-pin male (DB-25P) connector to the modem and a 25-pin, 9-pin, 8-pin, or custom-built connector to the computer. NOTE: FCC regulations require the use of a shielded cable when connecting a modem to a computer to ensure minimal interference with radio and television. Pin assignments are factory-set in your modem to match the standard DB-25 assignments in the following table. DB-9 connectors for IBM PC/AT-compatible computers should be wired at the computer end of the cable as shown in the DB-9 column. NOTE: A three-wire interface consists of Receive, Transmit, and Ground wires and does not support hardware flow control. Systems requiring three-wire interfaces must use software flow control. If your system doesnt support software flow control, use no flow control but be sure to use an error-correcting protocol. If you're using a Macintosh computer, ask your dealer for the correct modem cable; we recommend a Hardware Handshaking cable. SYMBOL 45 \f "Symbol"6Transmit Data PositiveSYMBOL 45 \f "Symbol"
SYMBOL 45 \f "Symbol"7Not connectedSYMBOL 45 \f "Symbol"
SYMBOL 45 \f "Symbol"8Receive Data PositiveSYMBOL 45 \f "Symbol"
1 Adds CTS capability when in Hardware mode. 3 To do this, you must ground pin 6. 4 To do this, you must ground pin 8. Some computer equipment supports only a few of the serial signal functions set in your modem. The minimum required for the modem to operate is as follows. * Required if DIP switch 1 is OFF for normal DTR operations, override disabled. If your computer and software support Clear to Send (CTS) and you wish to use Transmit Data hardware flow control (&H1), Pin 5 (DB-25) or Pin 8 (DB-9) is required. If your computer and software support Request to Send (RTS) and you wish to use Received Data hardware flow control (&R2), Pin 4 (DB-25) or Pin 7 (DB-9) is required. Your software and computer must support the 57.6K or 38.4K bps rate. Make sure the serial cable is shielded. Cables are normally six feet long, but longer lengths are possible. If you encounter problems with signal degradation, try a shorter cable. If you decide to build your own cable, use a low-capacitance cable. To further minimize the capacitance, connect only those functions (pins) that your application requires. Both your software and the remote system must use the same 10-bit data format. If you dont know the setup of the remote computers modem, phone ahead to find out what combination of word length, parity, and Stop bit is required. Set your communications software to the required scheme. Some communications programs use a kind of shorthand for formats, such as 7-E-1 or 8-N-1. The modem detects the format from the AT prefix of the next command it receives from your keyboard or from your software. You can create one or two customized configurations and store one of them at a time in nonvolatile random-access memory (NVRAM) as your power-on/reset default using the &Wn command. As long as DIP switch 7 is OFF when you power-on or reset the modem, your defaults are loaded into the modem's random-access memory (RAM). To view your NVRAM settings, use the ATI5 command. Your modem is preconfigured in the factory for the &F1 Hardware Flow Control template settings in NVRAM as Y0, and the &F2 Software Flow Control template settings in NVRAM as Y1. Tables on the next pages list the settings of the permanent configuration templates &F1 (default), &F2, and &F0, as well as parameters you can modify and store in the NVRAM configuration templates. * Initial Settings; match software settings of subsequent &W commands. The &F2 and &F0 templates differ from the &F1 template for only a few commands. The tables below list only those settings that differ from the &F1 template. 24Sets backspace key to delete. stored in NVRAM at position 0.
number stored in NVRAM at position 0. 12Disables ARQ/MNP for V.22 bis. from 1.5K bytes to 128. 532Sets Backspace key to delete. answers both overseas and domestic (U.S.
and Canada) calls, but only originates V.21 calls. V.42 modems to connect more quickly. Error control handshaking options: select the total values of bits 4 and 5. 032Disables V.42 detection and LAPM. S29V.21 answer mode fallback timer, 1/10th msec. 01Disables V.32 bis. Used for troubleshooting. 12Disables MNP/V.42 in V.22 bis. 24Disables MNP/V.42 in V.32 bis. 664Disables Call Indicate (V.34 only). NOTE: Bit-mapped registers have up to eight functions. Select the bit(s) you want on and set the register to the total of values in the Value column. * The valid range of rings that can be stored in NVRAM for S0 is 1-255. 1 is the default for modems with DIP switches. 0 is the default for modems without DIP switches. S0=0 cannot be stored in NVRAM. Regardless of the NVRAM setting, DIP switch 5 must be off for the modem to be in Auto Answer mode at power-on/reset. The word modem derives from the words modulation and demodulation. A modem modulates (converts) digital data (computer information) to analog data (fluctuations in tones carried over a copper telephone wire). The information is carried over a telephone network until it reaches its destination, where another modem demodulates the analog signals and converts them back to digital data so the computer there can use the information. This ability to use the telephone network for quick, inexpensive data exchange makes a modem a powerful tool that can be used by businesses and individuals worldwide to expand business and personal networks. Modems come in all shapes and sizes and their ability to communicate is based on the protocols they use (the rules they follow) to perform operations in identical ways. They may be preset or reset logically (using communications software) or reset physically (using DIP switches) to best communicate with the modem they are transferring information to and receiving information from. When the modems initially contact each other, the calling modem contacts the answering modem and introduces itself. The modems communicate via a series of signals to identify the appropriate protocol and speed for efficient data transfer. The answering modem either accepts the call or rejects the call. This transaction is called a handshake. Successful handshaking results in a carrier signal. When modems establish a carrier signal, your modem sends a Carrier Detect signal to your computer, indicating that the modems are ready to transfer data. If they fail to connect, your modem sends your computer a No Carrier message. Poor telephone line quality may cause a decrease in efficient data transmission. In order to ensure the data sent and received is reliable, error control was introduced by modem manufacturers. The modems check each data block received, and if something went wrong between locations, the receiving device instructs the sending device to resend the affected block. Modems send information at different rates, measured in bits per second (bps). Today, the figures can be staggering. In the most optimal situation, a 28.8 modem can exchange data as fast as 115,200 bps in data only mode, and a 14.4 modem can exchange data in 57,600 bps. In most cases, though, the speed relies heavily on the ability of the modem to adapt to line conditions at high speed. This adaptability is the most important feature of your modem. The smallest data unit sent is made up of a defined word length (7 or 8 bits each), a start bit (a 0 that indicates where the data unit begins), and one or two stop bits. Parity bits were the typical method of controlling errors before the introduction of cyclic redundancy check (CRC) error correction, described below under Error Control. A parity bit is either a 1 (odd parity) or a 0 (even parity), depending upon whether the data segment has an odd or even number of binary digits. Some systems allow mark parity (parity is always 1symbol 190 \f "Symbol"odd) or space parity (parity is always 0symbol 190 \f "Symbol"even). Parity bits are used less now that CRC is common. The setting 8-N-1 (word length=8, parity=none, stop bits=1) has become the most common data format in data communications. Both computers involved in a data transfer must use the same parity, word length, and number of stop bits, or connection isnt possible and garbage characters (random characters that appear in a nonsensical order) will display. The software must first be set the same on the computers at both ends of the data transfer before the modems can operate effectively. A simple phone call to determine the settings at the other end can clear this up quickly and easily. A specific parity setting is required, even if it is none (8-N-1), to assure that users with older systems can still communicate with newer modems. Another important aspect of modem communications is flow control, which manages the amount of data stored in buffers (temporary memory locations). Buffers are used to store information before it is passed on to a computer or modem. Flow control is used to prevent buffer overflow. The system uses either hardware or software (using control characters) flow control. We recommend the use of hardware flow control, because actual data may be mistaken for the control characters used in software flow control and the data may be distorted. Error control protects the integrity of data transferred over phone channels and is available for calls at 1200 bps and above. It can be disabled, although high-speed calls (above 2400 bps) should always be made using error control. The operations defined in an error control protocol include the following. Error detection through Cyclic Redundancy Checking (CRC).CRC is based on algorithms that calculate a value for an entire block of data. The CRC value attached to each block sent must match the receiving modems calculation. If not, the remote modem sends a negative acknowledgment to the sending modem. Positive acknowledgment of error-free blocks and negative acknowledgment of corrupted data blocks. Retransmission of corrupted data blocks. Always set your modem for error control, &M4 (by default) or &M5, for calls at speeds over 2400 bps. Most users communicating with V.42- or MNP-compatible modems will want error control at 2400 and 1200 bps, as well. Your modem is set at the factory to &M4, causing it to try for an error control connection and, if that isnt possible, to proceed with the call in Normal mode. The modem first tries for a V.42 connection, then an MNP connection. The information below assumes a modem setting of &M4. The exchange of signals between two devices in order to establish a communications link is called handshaking. ITU-T V.42 includes a two-stage handshaking process. A detection phase that is based on an exchange of predefined characters. LAPM (Link Access Procedures for modems) Negotiation. In this phase, the modems identify their capabilities concerning maximum data-block size and the number of outstanding data blocks allowed before an acknowledgment is required. This protocol is supported by the ITU-T V.42 recommendation. It was originally developed by Microcom, Inc. and is now in the public domain. MNP handshaking begins with an MNP link request sent by the calling modem. If the remote modem doesnt recognize the request, error control isnt possible. If the modems successfully establish a V.42 connection, they also negotiate for the associated V.42 bis data compression. If a V.42 connection is not established, but an MNP connection is established, they negotiate for MNP5 data compression. Modems using V.42 bis compression negotiate the following options. Possible sizes are as follows. Your modem uses 11-bit, or 2048-entry dictionaries, but drops down if the remote modem uses a 512- or 1024-entry dictionary. Maximum string length of each entry. As the dictionary fills, the modem deletes the oldest, unused strings. V.42 bis compression is more efficient than MNP5 compression, in part because it dynamically deletes unusable strings. In addition, it works better with files that are already compressed. These include .ZIP files downloaded from many bulletin boards and 8-bit binary files, which appear to the modem to be compressed. MNP5 compression should not be used with such files because it adds data to them, which lessens throughput. The additional data is stripped when the file is decompressed by the remote modem. When transferring such files, its best to set the modem to &K3. This allows V.42 bis compression to work dynamically with the compressed data but disables MNP5. Flow control of data from the computer is required when modems use error control for two reasons. 1.The transmitting modem stores a copy of each frame it transmits to the remote end until it is acknowledged by the receiving modem. 2.If errors are encountered, the transmitting modem must resend the corrupted data. This retransmission activity, combined with the steady stream of data from the computer, can overflow the buffer. Under error control, if a disturbance on the phone line causes an error to a data block, the receiving modem replies with a negative acknowledgment. In response, the transmitting modem retrieves a copy of the original data block from its transmit buffer, and every block it sent after that block, and retransmits them. This keeps the data error-free and in sequence. However, there is a retransmission limit: the modems hang up if line disturbances are so severe that one of the modems has retransmitted the same block of data twelve times without a positive acknowledgment. Because high-rate calls are more vulnerable than transmissions at 2400 bps and below, V.34 modems (such as your 28.8 modem) risk reaching the retransmit limit and hanging up. To prevent this, one of the modems requests that they fall back to a slower rate if necessary. When line conditions improve, the modems fall forward to the next higher rate, up to the original connection rate of the call. The following guidelines should help you to make the most of your modems advanced performance features. In many instances, experimentation and experience will indicate what works best for your applications. Throughput is the volume of user information transferred per second, without Start and Stop bits and other overhead information. Youll obtain optimal throughput under the following conditions. 1.Your communications software supports a fixed serial port rate (between your modem and the computer) higher than the connection rate (between the two connecting modems). An example of this would be setting your software to lock into the 38.4K bps rate, and retaining the default &B1 setting. 2.The call uses data compression. 3.Youre transmitting text files. Throughput is higher for text files than other types of files, such as .EXE or .COM binary files. 4.File transfer may be slowed down by a file-transfer protocol. Many non-text files require a file-transfer protocol, but throughput results vary. For example, certain public domain file-transfer protocols have the following effects. Both modems must use the same protocol for data transfer to take place. KermitNewer versions of Kermit support packets up to 9K bps and a sliding window design to eliminate turnaround delay. With earlier versions, however, throughput may be severely reduced due to short block lengths (possibly under 128 bytes) and acknowledgment turnaround time. XmodemThroughput may be reduced if your version uses short block lengths, for example 128 bytes. Some versions use blocks of 1K byte, which is much better, although overhead (error control protocol information) still affects overall throughput. YmodemThis protocol is similar to Xmodem with 1K byte block lengths and allows multiple files to be sent in one transfer. The above protocols further reduce throughput during error control (ARQ) connections. The accuracy of the data is checked twice, by the file-transfer protocol and by the modem. To avoid redundancy, disable modem error control by setting the modem to &M0. Zmodem The most current version of this protocol can yield the most efficiency. Leave the modem at its error control default (&M4) and data compression default, &K1. Zmodem performs the same kind of compression as V.42 bis; it turns off its compression if files are already compressed. Ymodem-GThis is an alternative protocol with the modem left at its error control default, &M4. Ymodem-G assumes the modems are using error control. Overhead is minimal, with throughput almost equal to that obtained with no file-transfer protocol. However, keep in mind that Ymodem-G is only useful if the modems are using error control. In addition, follow this recommendation only if your machine and software are set to hardware flow control. WARNING: If you are using an X-, Y- or Zmodem-type protocol, do not use the modems software flow control. '(CD[\^` . / J K b c e g t u ! 7K @ Normal][email protected] 1U]ac [email protected]"2Heading 2<&ZV][email protected] 3<&V][email protected]$Heading 4h<] @ Heading 5U @ Heading 6^ @ Heading 7V @ Heading 8V @ Heading 9V"[email protected]"Default Paragraph Font"@"
Normal Indent @ Footer! @ [email protected]"
xU]a>O>FIGURE/TABLE CAPTIONSummaryInformation([email protected] BrownAnna [email protected]%@@,"[email protected] Word 6.0W140;hU]a0O01_TOC 1pU]a.O.1_TOC 2! X8]ac0O0NON-STYLED PARAGRAPH! ][email protected]"@PRIMARY COMMAND LINE"@x]a&O2&SPACE#][email protected]@COMMAND OPTIONS LIST$x]a.OR.1_TOC 4%!